What were the 8 ways the rental housing market changed in 2017, and what can we learn heading into 2018? 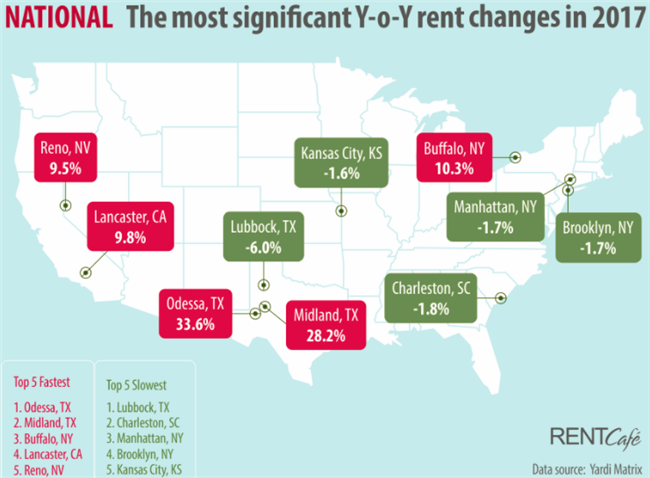 The folks at RentCafe have put together a report that looks at the rental housing trends in 2017 and analyzed rents from the 250 largest cities. — The national average rent increased by 2.5% reaching $1,359, about 24% higher than 10 years ago. — This means the average American renter paid approx. $400 additional rent over 2017 compared to 2016. — The average price for one-bedroom and two-bedroom units increased the most, 3.1% and 3.0% respectively. — Rent growth slowed down in the hottest markets. — With a 1.7% rent decrease, Manhattan and Brooklyn were among the cities with the most significant drops in 2017. — Viva Las Vegas? The City of Lights posted the fastest growth rate of all large cities (6.3%). — Facing a housing shortage and pressure coming from big cities, mid-sized markets saw rents soaring. Sacramento struggled with an 8.8% increase. — Small-size cities took the main stage in 2017 with spectacular growth rates. Renters in Odessa and Midland ended up paying approx. $3,400 in extra rent for the year. The U.S. apartment rent was $1,359 per month at the end of 2017, according to Yardi Matrix, about 24% higher than 10 years prior when the national average rent was $1,093 per month. The cost to rent an apartment in the U.S. has been rising steadily over the decade, with the lowest price of $1,052 in May/June/July 2010, and the highest point, $1,363, in August/September 2017, Nadia Balint writes in the RentCafe report. Across the country, many large cities started to see price decelerations in 2017, while small-size cities were the most vulnerable to rent increases. Renting in 2017 was defined by a much-anticipated price slowdown in the nation’s largest and most expensive rental markets. Several large-size U.S. cities have seen rates either decrease, stagnate or grow slower than the national average in 2017. Renting in small-size cities took the main stage in 2017. The most spectacular rent increases took place in the nation’s smaller markets, with 63% of the cities analyzed experiencing rent growth above the national average. About the Report Methodology: RENTCafe is a nationwide apartment search website that enables renters to easily find apartments and houses for rent throughout the United States. To compile this report, RENTCafe’s research team analyzed rent data across the 250 cities in the US. The report is exclusively based on apartment data related to buildings containing 50 or more units. Our report includes cities with populations over 100,000 and a rental stock of at least 2,900 apartments in 50+ unit buildings. Rent data was provided by Yardi Matrix, a business development and asset management tool for brokers, sponsors, banks and equity sources underwriting investments in the multifamily, office, industrial and self-storage sectors. Written by Rental Housing Journal Editors | January 17, 2018 | © 2018 Professional Publishing Inc. All Rights Reserved.